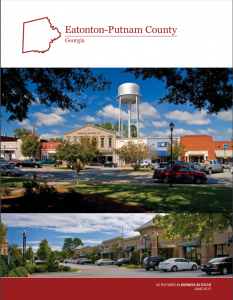 Eatonton, GA – October 5, 2018 – Terry Schwindler, Economic Development Director of the Putnam Development Authority earned the designation of Certified Economic Developer (CEcD), a national recognition that denotes a mastery of skills in economic development, professional attainment and a commitment to personal and professional growth. The CEcD exam was administered by the International Economic Development Council (IEDC) on September 29-30, 2018 in Atlanta, GA at the Hyatt Regency Atlanta. With 7 years of economic development experience, Terry Schwindler leads the economic development business attraction & recruitment efforts, as well as, the Existing Industry Expansion & Retention Program for Eatonton-Putnam County, Georgia.